The recent film La La Land opens with the impressibly choreographed number "Another Day of Sun" - featuring a hundred or so people singing and dancing in L.A. traffic. That's exactly how most people's daily commute is in Los Angeles. Well, except for the singing. And the dancing. And the jumping on cars. My wife, kids, and I generally enjoyed the film, but watching this opening scene I thought, "if I got out and touched - let alone jumped on - someone else's' car, I'm afraid I'd get shot." According to one study, Los Angeles has the distinction of having the worst traffic, not just in the country, but in the world. 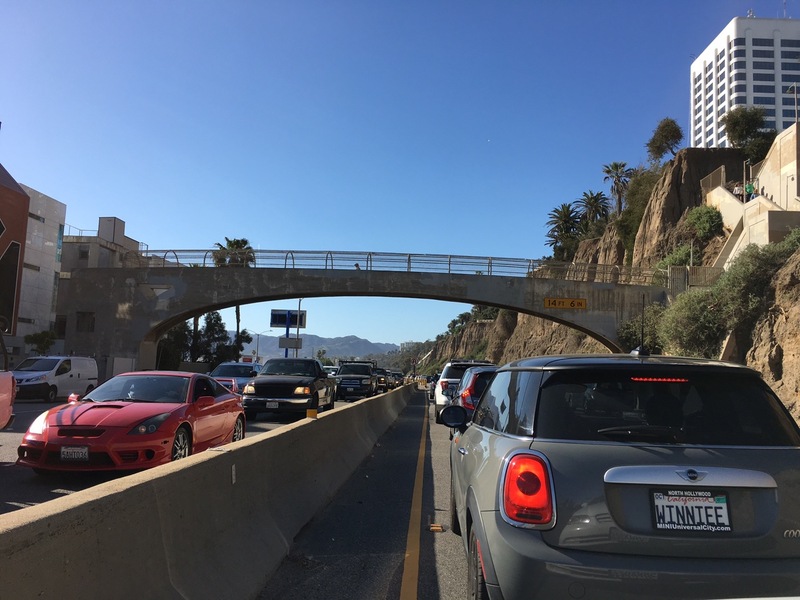 On average, the average Angeleno spends 104 hours a year stuck in traffic - at a cost of $2,408 a year in lost productivity and fuel. There's 16 million people in metro Los Angeles, so you do the math. These two photos are from the Pacific Coast Highway, the PCH, in Santa Monica last month. Traffic was particularly bad that afternoon. 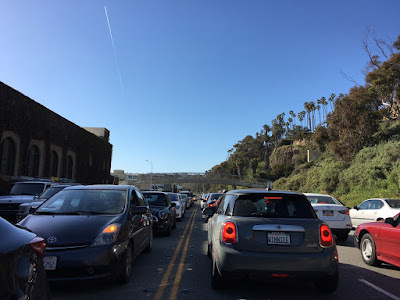 If you're going to be stuck in soul numbing, gridlock traffic, at least you can enjoy sunshine, palm trees, and - a bit farther up the coast - the Pacific Ocean. Most freeways are concrete canyons. At least the PCH offers interesting stuff to look at as you waste your life inching along in traffic. When my wife, kids, and I were living in L.A., we were stuck similar traffic a mile or so from here. My kids had to use the bathroom, and it was pretty miserable. As I looked out at the ocean, I saw an amazing pod of dolphins swimming right off the coast. "Look kids, dolphins!" I said, pointing them out to my kids. It was this weird combination of being both so awesome, and - stuck in traffic - so awful at the same time. Another day of sun. Another day experiencing L.A.